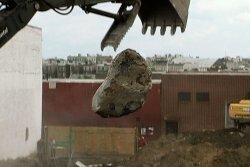 "Gut Renovation" is Su Friedrich's epic personal essay film charting the destruction of Williamsburg, Brooklyn. After living in the neighborhood for 20 years, the filmmaker was one of many who were forced out after the city passed a rezoning plan allowing developers to build luxury condos where there were once thriving industries, working-class families, and artists. Filmed over the course of many years, "Gut Renovation" is a scathing portrait of one neighborhood's demolition and transformation. Since 1978, Su Friedrich has produced, directed, shot and edited seventeen 16mm films and videos. Her films have won many awards, including Grand Prix at the Melbourne Film Festival, Outstanding Documentary Award at Outfest and Best Narrative Film at the Athens International Film Festival. Friedrich has had retrospectives at the Museum of Modern Art, the Whitney Museum, the Rotterdam Film Festival, the Buenos Aires Festival of Independent Cinema, and the National Film Theater in London, among others. She has received Rockefeller and Guggenheim fellowships, grants from ITVS and the Alpert Award in the Arts, and multiple grants from the Jerome Foundation, the NY Foundation for the Arts and the NY State Council of the Arts. A boxed set of 13 of her films is distributed by Outcast Films. Director Su Friedrich will be available for a Q&A after the screening.